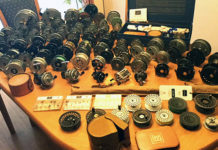 A while back I was checking through one of our fly fishing forum sites when I noticed a discussion about binoculars. 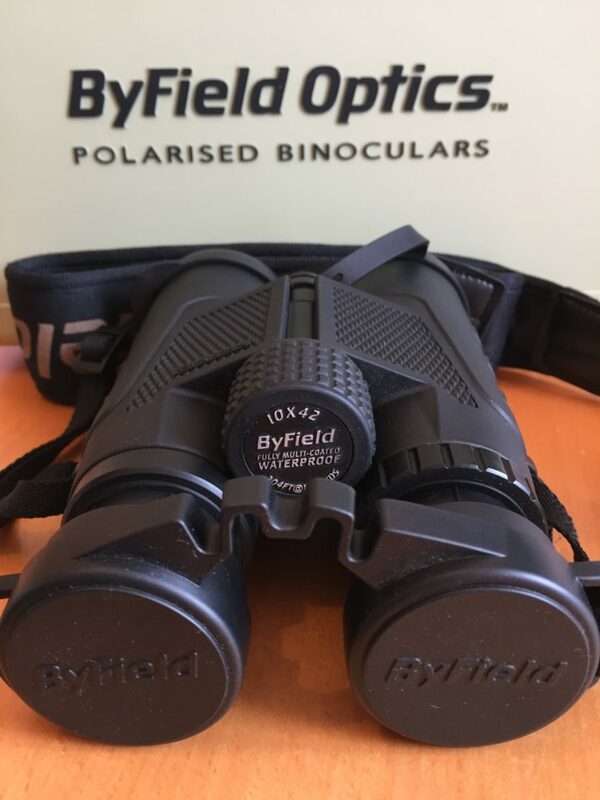 What caught my attention was a comment from one of our members asking if anyone knew if polarised binoculars actually existed or not, and how useful (or not) they might possibly be to anglers in general? I had to admit I had never heard of such a thing. Image stabilisation yes – for high-end marine binoculars. Very useful when bobbing about on a boat, but polarised binos’!!?? I was intrigued and so as with most things, a quick internet search revealed that such a product did indeed exist, and they were being manufactured and marketed by Trakka Systems based in Australia. 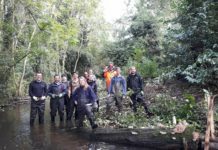 The company specialises in “critical vision systems” for the military, law enforcement and search & rescue organisations as well as for other professional applications like utility inspections and environmental surveys. Trakka Systems proudly presents our range of tactical, polarized binoculars and scopes, a world first in optical innovation and advancement. Incorporating our Patented (US Patent No. 9,470,901.) polarization methodology and design into our product’s integrated optical array we are able ensure that the viewer’s image is optically correct, providing a clear polarized image across the whole field of view at all times without any adjustment required, other than focusing. Our range of high quality binoculars and scopes is the only range of such products which is capable of offering users all the advantages of polarized filtration while maintaining perfect optical clarity and adding depth to the field of view. Our products are ruggedized in design to withstand harsh use and extreme environmental conditions. All of our binoculars and scopes use the highest quality lenses, which are shock-resistant, nitrogen-filled and weatherproof, and are additionally protected by the textured rubber outer-armour that has been ergonomically designed for maximum performance. There are two models of polarised binoculars available from Trakka. The TB-300 (8×56 – weighing 1300g), and the TB-200 (10×42 weighing 744g). We chose the TB-200 for our review as the lighter weight and size makes them more portable, and for fishing and wildlife watching purposes, the slightly narrower field of view and higher magnification seemed more suitable. The hard shell padded carrying case keeps the binoculars safe when being stored or travelling. 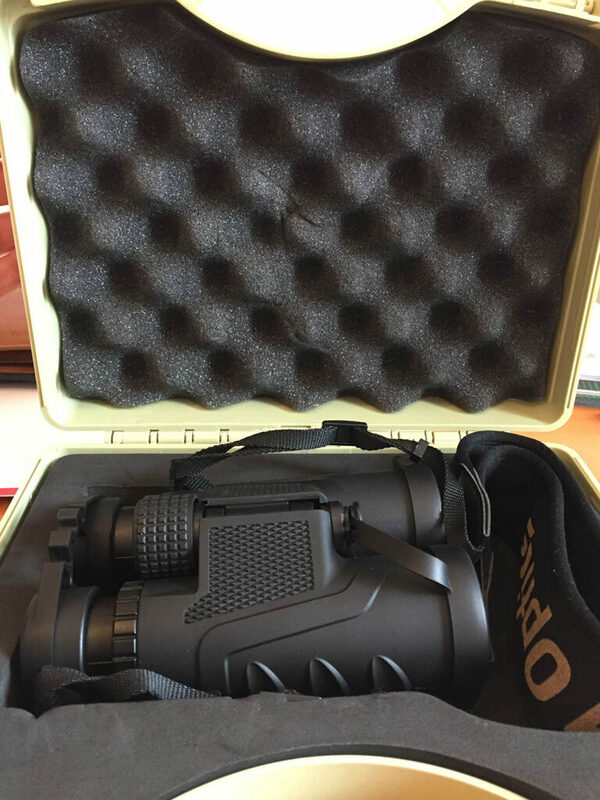 First impressions count and the binoculars arrived in their own impressive hard-shell padded carry case, befitting of a pair of high-quality optics. Fine for having on the car seat next to you, but a little oversized for everyday carriage in the fishing world. However, the rubber outer-armour of the binoculars serves as its own protection well-enough, whether you stuff them in a fishing bag, backpack, pocket or hang them around your neck. There are also lens covers attached via straps so you can just let them hang down without losing them when in use. 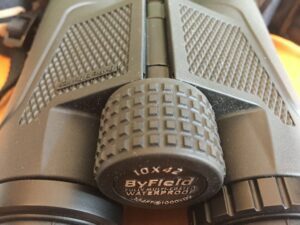 My review pair actually came badged up as Byfield Optics, a sister company to Trakka Systems, but which according to the Trakka company website now says has been integrated into their Trakka Optics division. Twist-up eye cups help prescription glasses wearers like myself find a better comfort fit, but I did find them a little narrow and so it sometimes took some adjustment around my glasses until I found the sweet spot. What I also noticed was that the added benefits of the rubberised body are that it is a non-slip surface making for easy handling, and also it remains much warmer to the touch than a metal-bodied set of binoculars would – particularly important come the colder months! The large knurled focus knob makes focusing smooth and precise. Focusing is very easy and precise thanks to a nice large knurled wheel. It operates very smoothly with just the right amount of resistance, and the grooves allow you to finely tune your focus. I imagine using these binoculars with gloves on in the winter would not be an issue. 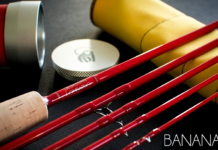 They are also weather-sealed so are water, fog and dust proof – perfect for us anglers then. But what of the key reason for testing these in the first place? Firstly, the Trakka’s polarised lenses were specifically designed to be integral to the binoculars and therefore to maintain the overall optical performance. This was key to the original design as there are other manufacturers who have produced filter caps previously that would fit over the eye pieces of standard binoculars, but they were prone to loss and importantly actually degraded the optical performance of the binoculars. 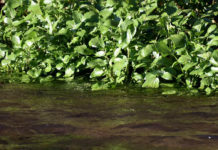 Shallow ponds and lakes can have lots of surface glare. I put them through their paces in a few different scenarios starting with an obvious check whether they cut the reflection off of some window glass which they did. However, more importantly down at a local lake I put them to use scanning the water surface for signs of life. I found that whether it was a cruising carp or a duck I was watching, the TB-200’s certainly did reduce the glare off of the waters surface making it much easier to maintain my view. Previously I have found it can be quite painful in bright conditions to try and watch anything for a length of time due to the reflected glare. 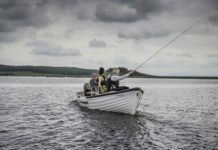 This means whether you are trying to track a specimen trout or chub, or scanning the sea for signs of life, having a pair of Trakka’s polarising binoculars with you really could pay off in terms of pinpointing your intended target more easily and in more comfort for your eyes importantly. I look forward to continue testing them in more fishing scenarios to come. Particularly out at sea, scanning for birds and surface action or floating debris that can hold fish – cutting the surface glare and reflections will certainly help with that. 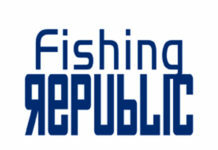 At this we do not have a dealer in the UK so prices are ex works our factory in Melbourne Australia. 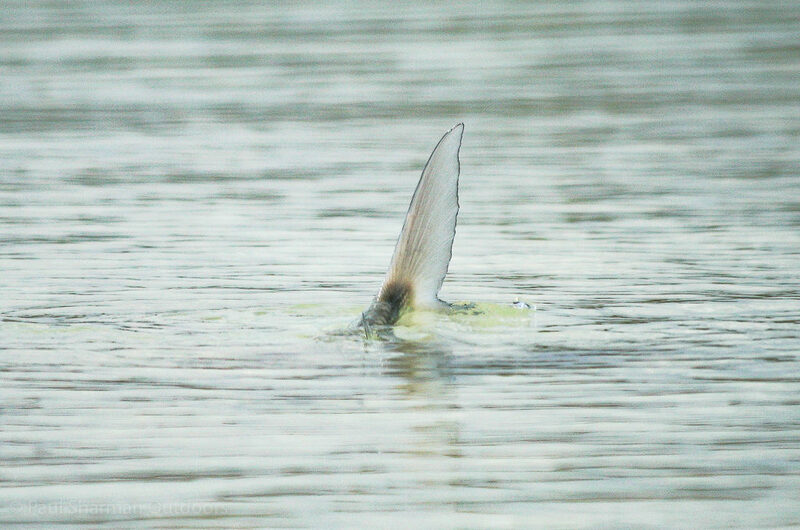 Whether stalking a carp in the previous pond photo, or looking for tailing bonefish on a sun-drenched tropical flat, polarised binoculars will help find the fish at distance by cutting the reflected glare for which your eyes will thank you! 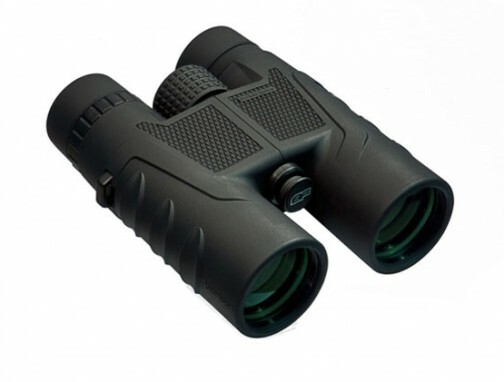 Well made and from a company with a strong background working with the military and law enforcement, you can be sure these binoculars are fit for purpose and will survive the elements. Having polarising bins is certainly kinder to your eyes in bright conditions when there is lots of glare on the water, and helps with finding the fish.